After reading recent articles about Dumbo from Michelle Harker and Tom Smith, I’ve been thinking about that animated classic. This year marks the 70th anniversary of one of Walt Disney’s shortest animated features, which was originally released on October 23, 1941. I think my favorite sequence is from the end of the film when Dumbo is riding on a train through Florida. It’s difficult to believe that the “vacation kingdom of the world” would open in the center of the state about 30 years after the film’s initial release! 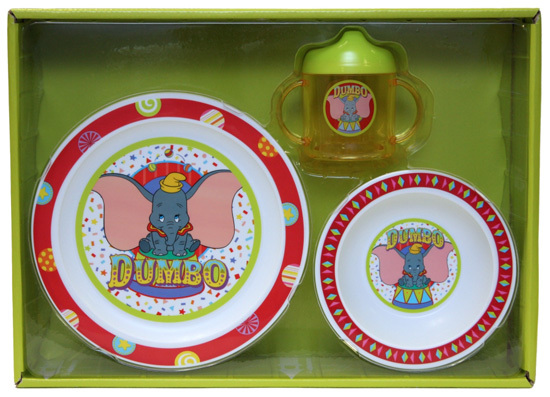 With these thoughts of Dumbo dancing in my head, I set out looking for Dumbo merchandise. Luckily, I didn’t have to look too long as Tracie Alt, Associate Product Developer for Home and Decorative, played the role of the stork one afternoon. 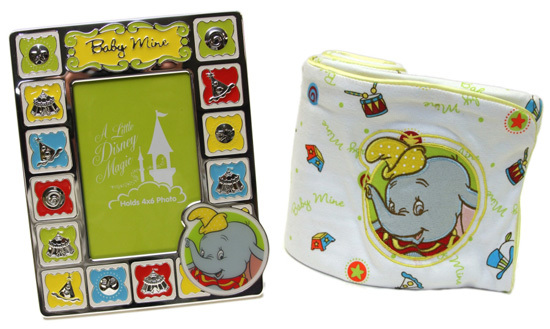 “These are new baby gift items and I’d like for you to write about them,” Tracie explained to me standing at the door to my office holding three colorful Dumbo-themed items (talk about perfect timing!). I asked why she selected Dumbo. Tracie selected a green and yellow color palette instead the traditional soft pink or soft blue often found on baby items. I love the whimsical circus theme as it just seems perfect for a baby (changing diapers can be like a circus act at times, or maybe that was just how I felt). 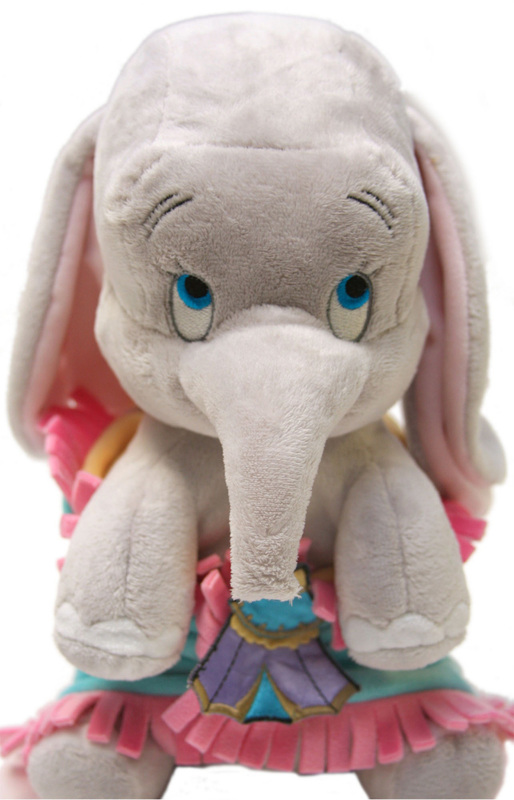 Also perfect for a baby is the Dumbo plush pictured at the top of this article. He is part of a line of plush characters wrapped in blankets that have been offered for a few years. Don’t you wish you could just hold him right now? It must be those expressive blue eyes that were first drawn by the late Disney Legend and animator Bill Peet. I also found some non-baby related items including the recently released Vinylmation – Animation #1 Series. The photo above features four figures from the series – one is the mystery chaser while the others are super chasers (or variants – though we like the term “super chaser”). While not necessarily Dumbo, they are elephants from my other favorite scene in the film. Well, I think I found all there is to see. The only thing missing was seeing an actual flying elephant. If I had seen that then I would have seen everything. Have you ever seen one?